Home Anxiety Blogging Fear Respect Twitter Writing I have BPA - Blog Posting Anxiety! There is something wrong. I just know it. Admittedly, I do have hypochondria tendencies that can pop up every so often, but this is real. Typically, when I do suspect an aliment or injury, I run to Web MD to search for answers. It was no help at all. Nothing was matching. Ever since February 14th, I’ve been experiencing the most confusing symptoms. I am queasy, jittery, along with a slight itchiness. After decades of teaching, I’ve got a pretty strong resistance to germs, but this just felt so odd. What was bothering me and causing these symptoms? Was I actually feeling… anxious? Could it be true? Oh no, I have B.P.A…. BLOG POSTING ANXIETY. It all started on Valentine’s Day. I had been thinking about starting a blog. I had been reading so many wonderfully written and thought-provoking blogs that I thought I would try it. I decided blogging would fulfill my wordy ways, or at least in writing. I looked around and decided to use BlogSpot.com. I went through the usual mind-numbing sign up procedure. (Thank goodness for the tab button to keep things moving.) I was ready to opine. Since a slightly (larger than I would like to admit) part of my day involves Twitter and tweeting, I decided to write about the journey to becoming indebted to this wonderful medium. The words just flowed. I sat in front of the laptop and smiled as the words poured forth. It has been such a positive experience and I was so indebted to others that it seemed as if I were writing a lovely thank you note. Blogging was fun. Then, my little blog inspired another blog. I couldn’t believe it. When I read @aredden’s blog, I was in awe. I actually touched someone enough that they wrote a blog because of my blog. I was hooked. I wanted to blog all of the time. I wanted to fill the Internet with my thoughts, words, feelings, and opinions. Then, I started to scratch. I thought it was dry winter skin. While I was typing, I had to keep stopping to scratch my arm. Then I noticed that I was feeling a little queasy. I finished the blog on “Inspiring Imagination” and went to find some Pepto-Bismol without posting the blog. The next day I thought, “I must not have liked the topic. I should start over.” I started typing away and this time the topic was “Teachers without Technology.” The red welts on my neck were growing and I kept the Tums next to me. Now, on day three since I posted the blog, I found myself reflecting. Why could I write two more blogs in two days, but I couldn’t post them. What was wrong? Suddenly, it hit me! I have BPA. The answer hit me. I care so much because based on their tweets and blogs, I do feel as if I’ve come to know some of them. More importantly, I respect them as educators and writers. There opinions matter to me. Consequently, I was afraid of posting anything I wrote. So, hopefully, I will continue to follow the prescription for BPA and write and face my fear of posting. And, by the way, if you are still reading, thanks! Nancy, you so perfectly described my feelings since starting my own blog a few weeks ago. I thought if I could get over the hurdle of the first blog post it would all be easy, but I seem to worry about each post more than the last. I worry about the topic, the tone, the voice, the content....everything. Somehow I manage to push the publish button every now and then. Loved your second post as much as your first....and feel better knowing about BPA. Is there a support group???? Since I make up so many of the aliments I have, I'm not sure about the support group. It is so nice to know others are experiencing the same symptoms. Thanks for writing. I understand your hesitation. I proof-read and proof-read, before I click on that "publish post" button. I also feel sad if I think no one is reading it. Keep it up, Nancy. I'm really enjoying your blog. Thanks for the comment. Your encouragement is very comforting and I appreciate that you "get it" I don't know what people did before spellcheck! I see that you teach fourth grade. I teach third grade this year, but I am moving with them to fouth next year. (I love fourth grade.) Thanks again. I am a complete newbie as well, and I totally understand your apprehension. I am working with a group of 8th graders in a tech enrichment class and we are all using blogging as a way to share our learning. Since I am asking the students to blog, I felt I had to model it and blog as well. However, I have never considered myself to be a writer (I still don't). It is so nice to see others venturing into this territory...it inspires me to overcome my anxiety and go for it! I really love your blog, keep publishing. 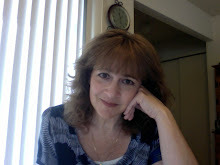 Hi Becky, Thanks for taking the time to check out my new blog. I really appreciate your comments on Twitter this morning and your permission to use your title, "With Twitter, everyone is at your school...in a virtual way. Love my PLN!" I'm about to start writing. Thanks again for the inspiration.